The story behind this DJ Banana costume is that a good friend of mine is a DJ….in fact, DJ Banana. Every year he throws an amazing Halloween party, sometimes two in one year. I had to show up with an unique costume because I and my wife’s friends always go to these halloween parties and show up in crazy, ridiculous (great) costumes. So, we wanted to show them. Lightbulb…show up at DJ Banana’s very own party as himself. Costume came from Party Fair, quite simple I may add. 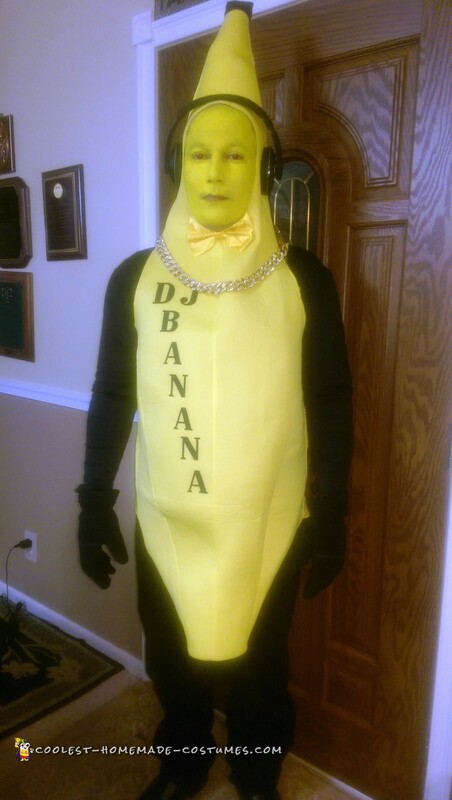 But with a touch of face paint, head phones, and a little bling….we got a DJ Banana. I even had a friend of mine add the lettering for that special touch. And Viola… I showed up at DJ Banana’s party and it was PRICELESS to see his face. He had a contest, I came in 2nd, but I ended up on his next year’s halloween party flier.